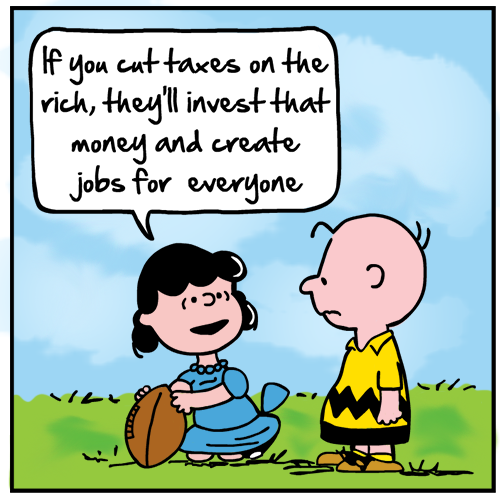 Its The Economy Stupid! – Innovative Retirement Strategies, Inc.
Home » Blog » Uncategorized » Its The Economy Stupid! Regardless of all the political rhetoric, BS, media bias, and name calling, the key issue in the upcoming election is not about fitness to serve or the mean things they may have said, these are all just distractions created by the media and each campaign to get you to focus on the “unlikable” characteristics of the opponent. What is important is the legacy that the next candidate will leave. One of the candidates supports higher taxes and greater entitlements while the other supports lower taxes. As the image below intimates, the left side wants you to believe that the corporations are greedy and will simply take the benefits received from tax breaks and pocket them. Its very easy to look at this simple image and buy into the “feeling” that the rich are greedy and will pocket any extra profits. But it’s really impossible to know with any certainty what someone will do. The critics will argue this point forever bringing up individual examples of select companies and their track records. Years ago, when I was studying Economics in college, I noticed that people either “got it” or “didn’t get it”. The laws of Economics are about as rock solid as death and taxes. As prices increase, demand decreases. Most people “get it” and can see the big picture. But there was always that one guy in class who was thinking of one personal case where the price of something didn’t impact “their” decision. Economics isn’t about the “one”. It is about the “whole”. What matters is what happens at the margin. For an individual, a small price increase may or may not make a difference in their buying decision. But if you keep raising the price, you’ll find there is some point where they change their mind. I love my micro-brew beer, for example. If the price of a six-pack went up a buck, I’d be upset, but I would likely still buy it. But if the price tripled, I’d have to seriously consider finding a substitute. Get it? Across the entire economy, when you look at the whole, these relationships are rock solid. Taxes raise the price of doing business. High Labor Costs raise the price of doing business. Obamacare raises the price of doing business. What happens when the prices go up? Demand goes down. When the price of doing business goes up, there is less demand for doing business. The government is providing a disincentive to do business. The way to look at the impact of a tax cut is to look at the impact of these increases in the cost of doing business. We have a historical record we can analyze. We don’t need to imagine what an evil business owner will do if given a tax break. Over the last 8 years, we have witnessed not only tax increases, but massive increases in the price of doing business from a regulatory and compliance standpoint. obamacare for example. If we look back even further, we can look at the combined effects of labor unions and tougher Department of Labor requirements that also increased the price of doing business. The results are obvious. High labor costs in the US have incented manufacturers to move their production overseas in order to be competitive. High taxes have provided an incentive for businesses to move their headquarters and taxation to jurisdictions where taxes are more favorable. None of this happened overnight. It has been a slow steady regression over time. American manufacturing was in its heyday in the post World War 2 era. American industry dominated the world. The automotive, steel, and manufacturing sectors made manufacturing cities like Detroit, Cleveland, and Milwaukee wealthy and robust with a strong middle class. However, increasing corporate taxes and rising labor costs forced those companies to either move their operations overseas or go out of business. The cities are mere shells of what they once were. Now look at that meme again and take everything I have just showed you and look at the inverse. Can I look at a specific company and say that they will move their operations back to the United States if taxes were reduced? Of course not. But I am absolutely certain that over time, a decrease in the “price of doing business” through lower taxes, lower labor costs, and lower regulatory compliance costs, WILL result in businesses returning to the United States. Memes like the one I posted may evoke feelings of being screwed by the big corporations. But unless you go out and start your own business, YOU need those companies for your own welfare. They provide you with a paycheck in exchange for your labor. Making everyone “Pay their fair share” makes a great rallying cry, but don’t be surprised when your employer decides to close the business or move it overseas. The rich and powerful have dozens of strategies they can employ to reduce and eliminate their taxes. Guys like me help show them these strategies. The higher the tax, the greater the incentive to take ever more extreme measures to protect wealth. By choosing a candidate that is in support of raising taxes, you are jeopardizing your own personal welfare. Do so at your own peril. Next post Are you killing it this year?